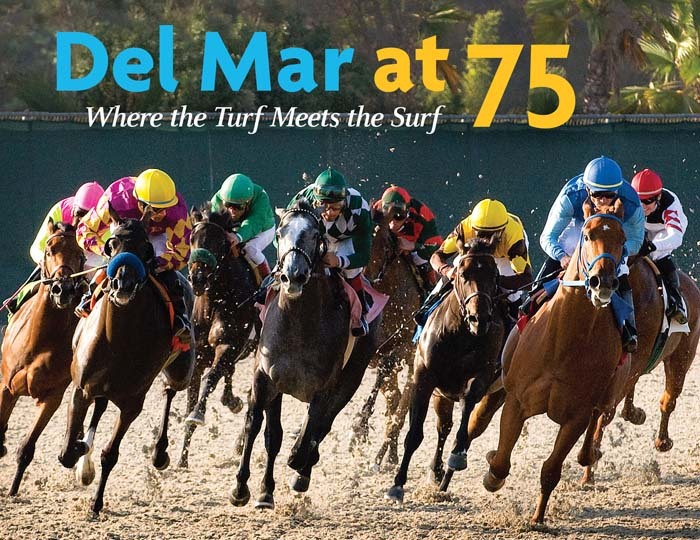 To help celebrate our 75th anniversary, we are featuring a new book “DEL MAR AT 75, Where the Turf Meets the Surf”. This 192 page, hardback coffee table book, 10 3/8”x12 3/8” in size will delight every Del Mar and racing fan. The book presents a “day in the life” at Del Mar, starting in the early hours at the barns, running through an afternoon at the races and finishes with the nightlife of concerts and nighttime quiet. The book also includes a short history of Del Mar, featuring classic black and white photos from the track’s historic early days. Photographer Barry Myers photographed at Del Mar during parts of 4 seasons so he could be at the track each and every day of the meet as well as before and after it. Jay Privman, award-winning writer for the Daily Racing Form and television commentator wrote the text and captions.